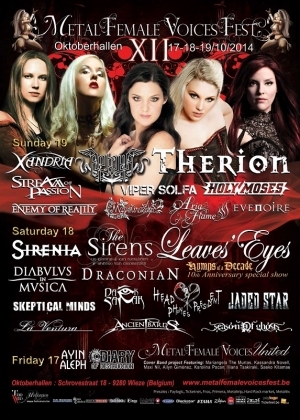 LEAVES' EYES will celebrate their 10th Anniversary at Metal Female Voices Fest 2014 with a special show, "HYMNS OF A DECADE", including a big stage set, pyros, visual effects and guests! LEAVES' EYES will play even brand new material from the upcoming album. On top of it all there will be a fan-song voting at www.facebook.com/leaveseyesofficial! Make sure to leave your vote soon! A unique gathering for some exclusive dates in Europe ! Don't miss their appearance at MFVF 12. This year, we are glad to present a special project named "Metal Female Voices United". The original idea* was a little bit different, but we can't manage it for this edition. So we kept all singers selected by a professional maestro, and jumped directly in another project. Mariangela The Murtas, Canssandra Novell, Maxi Nil, Ailyn Giménez, Karolina Pacan, Iliana Tsakiraki, and the Japanese singer Saeko Kitamae will join them to present you a special song.